One of a parents hopes is to give their child the wedding they have always dreamed of. 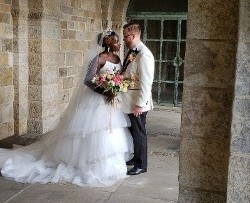 Our son Jason and his bride Octavia wanted a vintage style wedding. With a typewriter to be displayed at the reception venue. With today's technology, I didn't even know where to begin to look for one. As I began my search I came across Karl Business Machines. From our first contact with Rick, he was so very helpful. He took the time with us to select the perfect typewriter. He said we could pick one within the style and have it painted to the color theme of the wedding, He went over and above to help us in every way. The craftsmanship, quality and beauty of the typewriter was far more beautiful then we could have ever imagined. Karl Business Machine suggested to have the typewriter be a part of the wedding. By having our guests type wishes and blessings to the bride and groom. Our guest were not only impressed at how beautiful it looked, they couldn't get over how perfectly the color matched. With the age of the vintage typewriter, it was amazing as to how easy it was to operate. 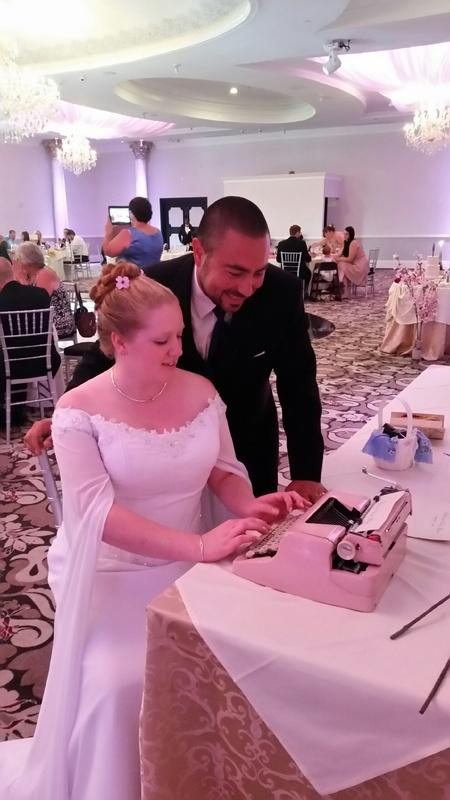 It was such a big hit, we were surprised at how many guests typed messages. Karl Business Machines helped us to make our son and daughter in law's fairy tale wedding come true. We thank you Rick for being a part of there special day. Diana and Fred parents of the groom. Someone's wedding is a beautiful memory that will carry them through their lifetime together. Karl Business Machines not only made a typewriter for me that fits the color theme of our wedding, but my personality as well. 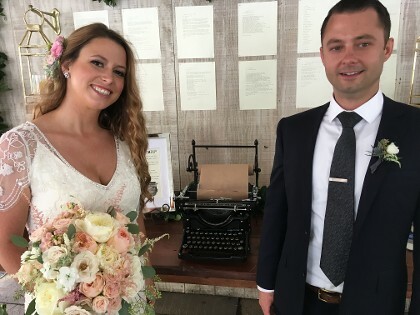 They took the time to listen to me about the wedding, and were so in touch they also found away to add my personality and likes to the typewriter. At the wedding reception our guests were able to type comments and wishes to us. Now we can also have the blessing of our friends and family in writing to cherish and add to the wonderful memory of our special day. 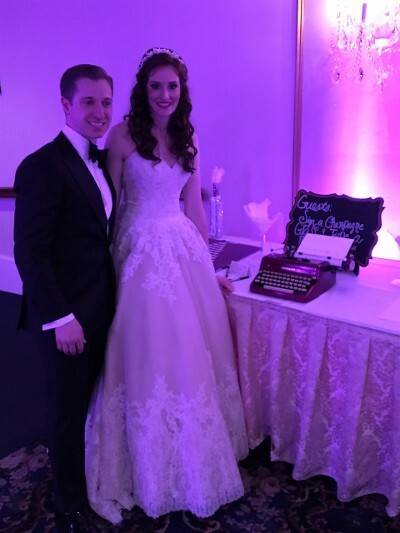 My husband Alec and I rented a purple typewriter for our Great Gatsby themed wedding. From the very start, Rick and his staff were fantastic and showed us what great customer service truly is! They were very accommodating and helpful. They printed out customized paper with our names on it for our guest to use. They thoroughly showed us how to use the typewriter and he packed it perfectly for us to travel with! After realizing the complexities of a typewriter, Rick even came to our wedding to help our guests use the typewriter! 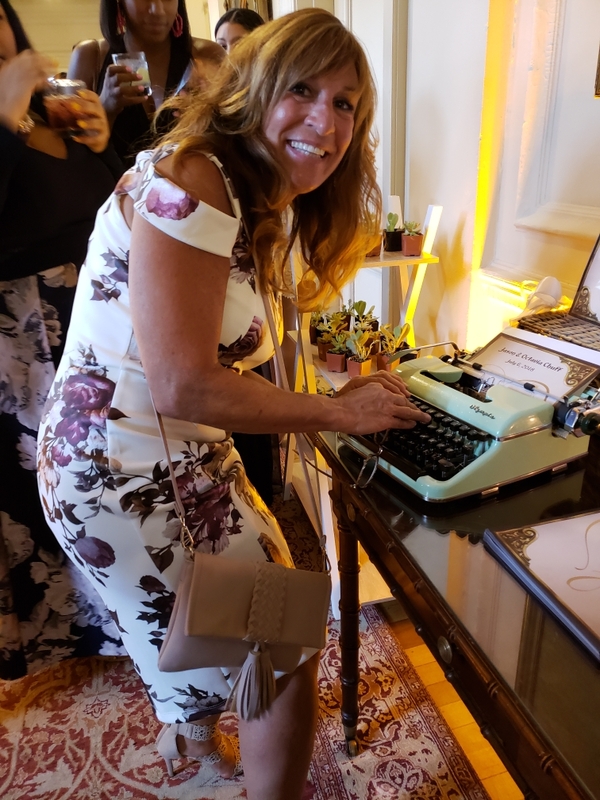 With Rick's presences, we received way more typed messages than we even thought we would and all our guest praised this little touch to our wedding. Every single step of the way he helped us in any way he could. Good customer service is very hard to find nowadays. Rick and his staff went above and beyond great customer service! We wish every single business we deal with were like the team at Karl's Business Machines. If I ever need or want to refer someone to get a typewriter it will be with Rick! They do an awesome job! Thanks again, and thank you for being a part of our special day! Can never thank you enough for the job you performed on my antique underwood typewriter. It was a HUGE success at my daughters wedding. 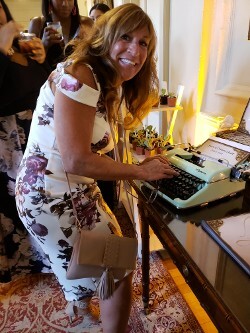 Your professionalism / craftsmanship and extreme friendly manner not to mention turning the typewriter into a centerpiece, AND you made me feel like I was as important a client as Tom Hanks was deeply appreciated. Please let me know if there is any other way to let others out there know how great you are. Thank you again, father-of-the -bride.